Canon tends to name its lenses with many terms that might initially baffle those new to its EOS system. Fortunately, these are fairly easy to understand, and knowing what they mean can help you to make the right choice when it comes to adding a new piece of glass to your kit bag. Here, we run through every term the company uses and explain what each of them means. This indicates a second-generation version of a particular lens. Sometimes it will only be this suffix that separates two particular lenses. This indicates a third-generation version of a particular lens. This designation, which is currently only applied to a couple of the company's lenses, is used to describe a lens that makes use of a Diffractive Optical element. These elements are designed to help control chromatic aberration, which typically appear as coloured fringes around the edges of details. They are also used to help control a further effect known as spherical aberration, which softens images. It also allows Canon to make these lenses more compact than they would otherwise need to be. You can easily spot these lenses, as they are the only ones to have a green ring towards the front of their barrel. EF stands for Electro-Focus and this applies to almost every Canon lens that’s intended for use with the company's full-frame DSLR cameras (and EOS film bodies). It's also used to describe the lens mount on these bodies, which features a single red dot that's used for mounting the lens. This term indicates that the camera and lens can communicate electronically to drive the focusing system inside the lens – and all EF lenses have their own focusing motors built into them. You can use EF lenses on all Canon EOS DSLR bodies, and you can also use these on Canon’s range EOS M series of mirrorless cameras via the EF-EOS M adapter. EF-M lenses are designed for Canon’s EOS M system of mirrorless cameras. They are typically smaller than EF and EF-S lenses, and more streamlined in their design. EF-S lenses are designed exclusively for use with Canon DSLRs that have an APS-C sensor. The EF-S mount features a white mark that's used for mounting the lens, although as you can still use EF lenses on EF-S bodies, you will also see the red EF dot on this mount too. This includes all models with two, three of four digits in their title, such as the EOS 1300D, EOS 200D and EOS 80D respectively, as well as certain single-digit models such as the EOS 7D Mark II. Because of how these are designed you should never use them on full-frame bodies as you would risk damaging the mirror. Perhaps the main advantage of these lenses is that they can be designed to be smaller and lighter than equivalent EF lenses, as they are working in conjunction with a smaller sensor. IS stands for Image Stabilizer. A lens with IS in its title has some form of image stabilisation built into it. 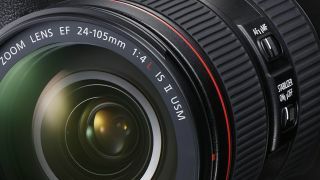 Canon lenses do not offer image stabilisation for images as standard in their bodies – although they are starting to offer digital image stabilisation for video – so this is a desirable feature. This system lets you capture images at slower shutter speeds than you would otherwise be able to use, and it works by moving elements inside the lens to compensate for any movement it can sense from the user. It’s particularly useful in telephoto lenses, as these generally require moderately fast shutter speeds to keep images sharp. With this system in place, you can use slower shutter speeds safely. Image stabilisation is not effective against the movement of a subject, so you still need make sure your shutter speed is fast enough to keep a subject in motion sharp. Some lenses do offer a separate image stabilisation mode that's designed for moving subjects, although this is only effective with a technique known as panning. L lenses are Canon’s ‘luxury’ selection of optics, and these are identified by a red ring around the front of their barrel. These are designed for enthusiasts and professional users, so they typically have a number of things in common. First, they tend to make use of optical elements which are either not present in other Canon lenses or just not used as liberally. These include fluorite and Ultra Low Dispersion (UD) elements, which are mainly used to help to control chromatic aberration. They also tend to offer wider maximum apertures (lower f/ numbers) than other Canon lenses. This means they can be used to achieve very shallow depth of field, with lots of background blur, but this also makes them particularly suitable for use in low-light conditions. L lenses tend to be built better than Canon's conventional lenses too, with protection against weather and dust. Many of the longer telephoto L lenses are typically finished in a putty-white casing, which also helps them to deflect heat – useful when working in hotter climates. This term is currently only used on one lens, the MP-E 65mm f/2.8 1-5x Macro Photo. This lens differs from Canon's other optics as it’s a manual-focus-only macro lens that can reach magnifications of up to 5x life size. Standard macro lenses tend to offer a maximum 1x magnification, which means they can record a subject on the same size on the sensor as it appears in real life. Why do some Canon lenses not start with the letters EF? All Canon lenses designed for its DSLRs and mirrorless cameras start with the letters EF, with the exception of the company’s tilt-shift lenses and one of its macro optics. The reason? These lenses are the only optics in Canon's current lineup that do not contain autofocus motors, so the designation ‘Electro-Focus’ does not apply to them. A lens marked STM has a stepping motor in its design. These types of motor are designed to provide smooth and silent autofocus performance during movie recording. At the time of writing, all of Canon’s lenses designed for its EOS M line of mirrorless cameras have STM technology built into them. A number of lenses designed for its EOS DSLRs are starting to offer this too. USM stands for Ultrasonic Motor, a term that's applied to the most common focusing system found inside many of Canon’s lenses. There are a number of different types of USM technologies, but they all promise the same thing: fast and quiet focus when shooting images. This is done by converting ultrasonic vibration energy into rotational force. Although Canon does not use the term in the name of any its lenses, a recent update to the this technology is dubbed Nano USM. Although this works on the same principle as the standard USM system, it promises much the same benefits ascribed to STM lenses – namely, speedy and silent focus during video recording. This indicates that the lens is designed with tilt-shift functionality. This lets the photographer move the optics of the lens in a very different way to other lenses, shifting them around, and at an angle to, the sensor. Tilt-shift lenses are very useful in architectural photography, as they allow the photographer to correct for an effect known as converging verticals, which makes buildings appear to be toppling over. They are also commonly used in landscape and product photography, as they allow you to control depth of field independently of the aperture. So, you can achieve much deeper depth of field than usual without having to use a very small aperture.